Yes it is true, Christmas is back, and the blog will take a two week vacation. Well deserved if you ask me, which I am sure you do. Here is a suitable film from the GPO Film Unit (which I wrote about the other week). The first is from the second season of The West Wing, the episode Two Cathedrals, one of the best of the series. It is when president Bartlett (Martin Sheen) has to decide whether to run for re-election or not, whether he is a quitter or a fighter. The next clip is less amazing, but it is still good, and I happen to have a weakness for Spy Game (Tony Scott 2001) in general, so any excuse to include it. Nathan (Robert Redford) tells the story of how he recruited (or tricked rather) Tom Bishop (Brad Pitt) into working for the CIA. The clip ends with the words "Executive producer Michael Mann" which reminds me that I have yet to write a blog post about Mann, despite him being my favourite filmmaker for the last decades. That love affair began in the late 80s with Miami Vice. But to end today, here is Dire Straits's own video. The other day I was watching De hombre a hombre (1949) an early film by Hugo Fregonese, a nomadic filmmaker originally from Argentina. It got me thinking of another South American-born filmmaker who had a nomadic career, the Brazilian Alberto Cavalcanti. He came to Britain in the 1930s and began working at the GPO Film Unit. GPO stands for General Post Office and the films produce by this remarkable unit were more often than not extraordinary (I still remember how dazzled I was when I first saw Night Mail (1936) in my late teens) so today's blog post will be a celebration of the GPO Film Unit. GPO, which began its operations in England in 1660, was a government run agency responsible for the mail, and later also telephone and telegrams, in Britain and across the British Empire. The Film Unit was established in 1933, with the initial aim of explaining to the public what the GPO was all about. John Grierson was put in charge of it, which was a very apt choice. Grierson was a film theorist, a filmmaker, a critic and a progressive intellectual who was concerned about the fate of democracy. He felt that films should be grounded in real life, "the creative treatment of actuality" and that they could and should be used to educate the citizens about the world, and to install a democratic sensibility in them. In the GPO Film Unit his ideas would be realised. The Film Unit was not an original invention, it was an offspring of the EMB Film Unit (Empire Marketing Board), but it brought something new to British cinema. Grierson had hired an impressive selection of filmmakers, writers and artists (including Norman McLaren, who had always had a special bond with Grierson). Among the more prominent filmmakers on the Unit were Humphrey Jennings, Harry Watt, Basil Wright, Len Lye and the above mentioned Cavalcanti. In addition, the poet W.H. Auden wrote commentary and Benjamin Britten wrote music for several of the films. The writer J.B. Priestley was also involved, writing commentary and also performing in front of the camera. Night Mail is perhaps the greatest film that was made there, and Watt, Wright, Auden, Britten and Cavalcanti were all involved in the making of it. It is both beautiful and expressionistic, and the second half in particular is amazing. 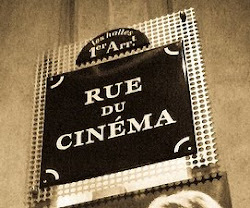 The films made promoted modernity, community and communication. Although they wanted to create a sense of Britain, many of the films can be said to be engaged in some kind of nation-building, there was also a message of internationalism. Sometimes this was made explicit as in We Live in Two Worlds (1937), celebrating a borderless world where trains, planes, letters and telephones would united all the countries and there people. While many of the films were part of integrating the empire into Britain, there was also a Marxist bent to the films, the internationalism is part of that, and some of the practitioners on the Unit were socialists. The films are celebrations of the workers and the farmers, the coal miners and the clerks. There were also many stylistic influences from the Soviet filmmakers of the 1920s, such as Dziga Vertov and Sergei Eisenstein. But also from the US, especially the films of Robert Flaherty, who would also make films for the Film Unit. But the films made at the GPO Film Unit were much more than educational films and conventional documentaries. The filmmakers were experimenting with sound, images and editing to create something more artistic, in some cases pure avant-garde films, with the GPO logo more as an after-thought. Norman McLaren and Len Lye in particular perhaps, but the German animation artist Lotte Reiniger was also making films for the Unit that were decidedly not traditional or documentary. The reason for this breath and the combination of realism and avant-garde was probably due to the two figureheads, Grierson and Cavalcanti. Whereas Grierson was about social truths, politics and progress, Cavalcanti was interested in art and experimentations, and had even a fourteen point program of how best to make films, which emphasised the combination of "the social, the poetic and the technical" and said that "without experimentation, the documentary ceases to exist". The GPO Film Unit was active until the war but in 1940 it was abolished and replaced by the Crown Film Unit. The creativity and imagination that was let loose during those six years is pretty astonishing. I wonder if there has ever been anything like it. Song of Ceylon (1934) is a very different film. It is an impressionistic account of life on Ceylon (Sri Lanka), co-produced by the Ceylon Tea Board. But the artists kept a critical distance from the imperial project and in subtle ways might be said to critic the politics while celebrating the people and nature of Ceylon. It can perhaps be said to be a Buddhist film. It just occurred to me that in my essay on Henry Hathaway I had almost completely forgotten to mention the actors and actresses Hathaway worked with, or the writers. Even though I regard him as primarily a visual artist, and that the importance of his films lies in the images, I shouldn't neglect the rest. He was for example particularly fond of the writer Grover Jones who, among others, wrote The Lives of a Bengal Lancer, Trail of the Lonesome Pine and The Shepherd of the Hills. And some of Hathaway's later westerns were written by Marguerite Roberts. But Hathaway didn't like dialogue, he wanted to keep it down. Although in some of his films there are some lengthy pieces of expository dialogue which damages the flow of both the individual scene and sometimes the film. Maybe that was when the writer was too strong so Hathaway couldn't ignore him or her. As for actors he did many films with Gary Cooper, and many with Tyrone Power, and he was equally good with actresses, such as Susan Hayward and Gene Tierney. And, as Blake Lucas just pointed out, Harry Carey is fantastic in The Shepherd of the Hills. There's a lot more to say, and I would like to engage with the theme of revenge that is so common in Hathaway's films. To see how he works with that and if and how it changes over time. In short, there's a lot of work still to do. 2013-11-26, a new piece, about Souls at Sea. There is a certain snobbishness in some auteurial circles, where certain directors are almost by default deemed unworthy, and there is also a tendency among the rank and file to consider Andrew Sarris's rankings in American Cinema: Directors and Directions as gospel. This can lead to unfair dismissals of highly competent and interesting filmmakers, dismissals that are doubly unfair when they are made even before their films have been watched and analysed. Another problem with auteurism is that films can be lost or forgotten because they're not made by an "established" auteur, despite being of some brilliance. Which brings us to Henry Hathaway. I have to say that I'm surprise by the lack of material about him. I said in an earlier post that Frank Borzage was not getting enough attention, but he has still received a fair share of comments and essays. Hathaway on the other hand hasn't even an entry at Senses of Cinema. No, he has not received much critical attention at all. He was (unfairly) dismissed by David Thomson in A Biographical Dictionary of Film, and Sarris put him in the rather boring category "Lightly Likeable". James Agee once wrote that he didn't believe Hathaway was "better than thoroughly competent". And today he is often overlooked and I don't know of any monograph about him, while his name or his films (with a few exceptions) are seldom included in film history books. He does figure in the book series Hollywood Professionals, in the first volume no less, and there is the very excellent Henry Hathaway, a sort of "Hathaway on Hathaway"-book consisting of interviews the late Polly Platt made with him, and which covers his career up until the 1950s (so it ends well before he stopped making films). But that is not much and after having watched a large part of his films I've come to the conclusion that he deserves more, that he is a director of force and consistence, with considerable skills (a feeling that I've had since I was a teenager and watched Call Northside 777 (1948) and Kiss of Death (1948)). This blog post is an introduction, a starting point for further research if you like. He was born in 1898 and died of a heart attack in 1985 and he directed his first films in the early 1930s, cheap Westerns based on novels by Zane Grey. Before that he worked as an assistant to the likes of Victor Fleming and Josef von Sternberg, and for one of the very few female directors of the time, Lois Weber, whom Hathaway rated highly. He had his major breakthrough, both commercially and artistically, in 1935 when he made The Lives of a Bengal Lancer (a character study about British colonial officers in India) and Peter Ibbetson (a strange, eerie love story which was much praised by André Breton and the French surrealists) and he had two major phases in his career: the post-war semi-documentary thrillers, beginning with The House on 92nd Street (1945), and the late Westerns in the 1960s including The Sons of Katie Elder (1965), the amusingly strange 5 Card Stud (1968) and the first version of True Grit (1969). On the whole he did almost 70 films. Hathaway was a wealthy man, perhaps you could say he was financially independent, but unlike most major Hollywood filmmakers he didn't become his own man, neither did he start his own company nor did he produce his own films. He was a company man, first at Paramount and then, most famously, at Fox (or 20th Century Fox). But this seemed to suit him just fine. Being a company director meant that you in most cases were given a script by the studio and asked to film it, and you had to make the best of it. However, after you had been given the assignment, you would have considerable freedom to go about it as you sajw fit, at least if you were somebody like Hathaway. At Fox he worked for producer Darryl F. Zanuck, a committed cinephile (yes, cinephiles were not invented by the French New Waveers), and according to Hathaway, Zanuck: "had a half dozen directors that he trusted, Joe Mankiewicz had a completely free hand, I had a free hand, Henry King had a free hand. Zanuck never bothered people that he had faith in." But Hathaway was primarily a visual artist. When he is interviewed he speaks more about the images, and when he mentions influences it is Vermeer, Rembrandt and Brueghul (not sure which one) that comes up, not writers. He also said at one point that one of the first things he did when preparing a film was to "choose a cameraman to go with the style I want to set for the film". And he was very particular about what he wanted. He would sometimes wait, and hold up the production for days, until the light was exactly right for a particular shot, dismissing angry calls from the producers. He worked with a few trusted cinematographers, at Paramount with the great Charles Lang Jr. and at Fox several times with the equally great Joseph MacDonald. He also did several films with Lucien Ballard, so it is clear that he only worked with the best. He also worked his crew hard. One technician said that "Hathaway seems to be everywhere at once, and does not recognize that the impossible exists, or that there are 120 degrees of sunshine. He drives on, possessed with a fury of direction." And Hathaway himself said that "I'd say my greatest directional strength is my stubbornness: I know what I want and I go after it." His style is very dynamic, I'm almost tempted to say organic, and his style has been rather consistent from the 1930s and onwards. (But he isn't immune to his surroundings. His films before the second world war has a different texture than those after the war, which is partly explained by the fact that he left Paramount and Charles Lang Jr. and went to Fox.) He works with a lot of depth of field, little camera movements, and very rich, dense images. Often the camera will be at a low angle, capturing the whole of the room, including the ceiling. There is always something in the foreground that gives the shot a 3D-like effect, and he loves shadows and frames within the frame. He preferred location shooting to the studio, and he was always interested in documentaries. That he should be a central part of Louis de Rochemont's efforts of making films directly from the news headlines and from the files of FBI and other government agencies is not surprising. And they're very good, especially 13 Rue Madeleine (1947) and Call Northside 777, but arguably the best is Diplomatic Courier (1952), mostly set in Trieste, Italy, and with Patricia Neal in a great role. (For that one Hathaway himself did not go to Trieste, the locations were shot by a second unit and then skilfully integrated with the rest, which is ironic since Hathaway usual shot his own second unit stuff...) And his interest in locations and documentary also means that the scenes are taking place in this world, where passers-by, bystanders and ordinary persons can be seen going about their own business behind, besides or even in front of the main characters. If a set has a window you can always see what gojes on outside that window. Bazin suggested that film is like a window, but sometimes the window also has a window, and this is one example of how Hathaway works with frames within the frame. Rawhide does also work as an example of another consistency in Hathaway's work and that is violence and terror. There's a lot of that in his films, and you can never be sure that characters will survive. In fact after having seen a few of his films you always expect the worst. 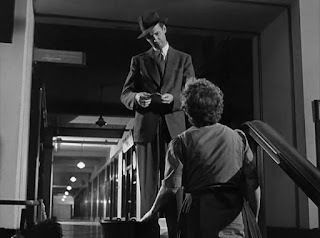 It is a tense world that is being portrayed, often populated with duplicitous and/or sadistic people, like Tommy Udo (Richard Widmark), kicking an old lady in a wheelchair down a staircase, in Kiss of Death. (Spoilers ahead) It is telling that when Hathaway made Fourteen Hours (1951), a film about a guy who threatens to commit suicide by jumping from a tall building, Hathaway wanted to end the film with the guy killing himself. But the head of the studio said no because his daughter had just committed suicide that way. When Hathaway made True Grit, a film that was important to him, he wanted to give it a fairytale flavour, in style, diction and acting, and despite his fondness for realism and documentaries, Hathaway also had an otherworldly side to him. 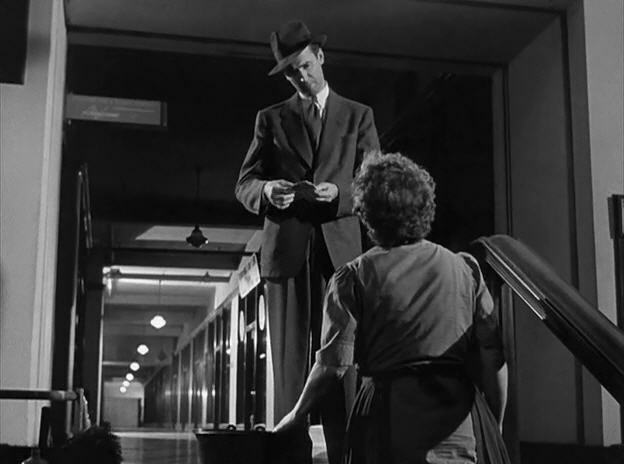 Peter Ibbetson is the obvious example, but there are many films which have elements of this, often by the use of colour like in Niagara (1953). That fantastic film is shot in a dreamy haze and sometimes with an abstraction as if it was an avant-garde film. It might prove Welles right, that Hathaway was more interested in images than story, or perhaps that when given material that was below par he tried to ignore it, instead experimenting with lights and colour and angles, letting his visuals become the story in a sense. I haven't spend much time discussing individual films, but there's enough to say about them for a whole book, so I'll leave that to another day. I just want to highlight one particular sequence, which is from The Shepherd on the Hills, one of Hathaway's best and most unusual films. It is a rural drama (I suppose the genre would be "western" but that is not very helpful) and in it an old man comes to a tense village, to return to his old home he left many years ago. After he has got the keys he walks to the house, through the forest and over a field, and then he enters it. He walks around, he looks in drawers and boxes, he plays a little tune on the piano, re-entering his past in a way. The sequence has no dialogue, just a little music and it is very long, and it is very beautiful. Hathaway is mostly discussed as an action director, and he did magnificent action sequences, but this sequence is actually more typical of him. Despite his reputation for being a mean and angry man, he made films that were tender and sincerely felt, and this, together with his mastery of compositions, makes him a great filmmaker and what I call an "external auteur". I'm elaborating this concept in my thesis but if you don't care to wait until it is published I'll just say that I make a distinction between external auteurs and internal auteurs. An external auteur is somebody who makes films with quality and consistency but has no personal presence in the film, while an internal auteur is almost always within the film, as a voice, as an actor, as a character, or as an autobiographical ghost. Bergman, Ekman, Welles, Fassbinder and Eastwood are among my examples of internal ones. There have been some appreciations of Hathaway's work. Here for example is the British writer, critic and filmmaker Basil Wright, who wrote like this about Hathaway in the late 1930s: "Note first the verisimilitude of the settings, second, the modest but unerring rightness of all his camera angles, and third, the sense of ebb and flow of passion between two tough but inarticulate humans." Wright was only talking about the film Spawn of the North (1938) which I haven't seen, but that quote is true about most of Hathaway's films. And he did appreciate his own worth. He himself once said: "There's no reason except me for The Sons of Katie Elder to be as good a picture it was." So where would I place Hathaway among American filmmakers? He is not exceptional like, say, Anthony Mann or Vincente Minnelli, but for me he compares favourably to directors like Frank Capra, John Huston, George Stevens or Elia Kazan. It would be interesting to do a detailed comparison between Hathaway and another Fox company man, Henry King. For now I'd suggest that King is more nostalgic and more ambitious than Hathaway, for good and bad. Hathaway has himself said that he was influenced by Marshall Neilan and Victor Fleming, and the combination of von Sternberg and Fleming (and script writer Jules Furthman) in Hathaway's early days means that he was moving in the same circles as Howard Hawks, but they're much different. Hawks is a more distinct and obviously idiosyncratic filmmaker, and more interested in characters and dialogue than Hathaway. Hathaway and John Ford also makes for an interesting compare and contrast. It could reasonably be argued that when Hathaway is at his best he resembles Ford, but is not at all as good. With Ford you get a whole world, with Hathaway you only get great films.